When choosing paint colours for a room, it’s hard to know if you should do the whole lot in one colour, or add feature walls. And will that work with my flooring, & how do I add pops of colour in my décor? Well there is a formula that can help you with how much of each colour to use! It’s the 60-30-10 proportion method. This stands for 60% of the colour in the room should be the same. Most of the time this is the walls & ceiling in a similar colour. Then 30% of an opposing colour. This is usually brought in with furniture or the flooring. The last 10% is the fun decorator items. This is the pop of colour that may be too overwhelming in a large quantity. But don’t underestimate the 10%, this can still dominate if positioned correctly! You can play with shades of colours, with these usually being able to blend together into one proportion percentage. For example, light to mid greys will blend into whites, whereas mid to dark greys can blend with black tones. Just consider if an item jumps out at you, if it does then it doesn’t blend with its surroundings. This makes it a contrast & therefore a different proportion to what is around it. You may choose to move the item to blend with something nearby & allow another piece to be the feature contrast. 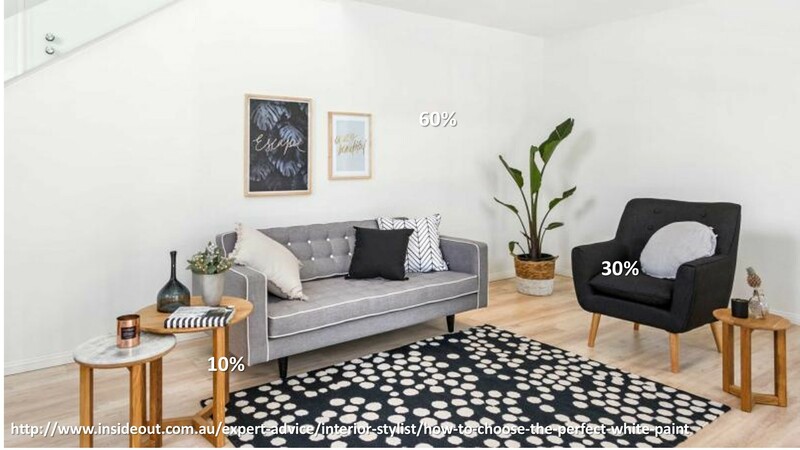 Using these colour proportions helps prevent your home from looking cluttered & mis-matched. As well as helping you choose which colours you want to dominate to bring fun to the space.